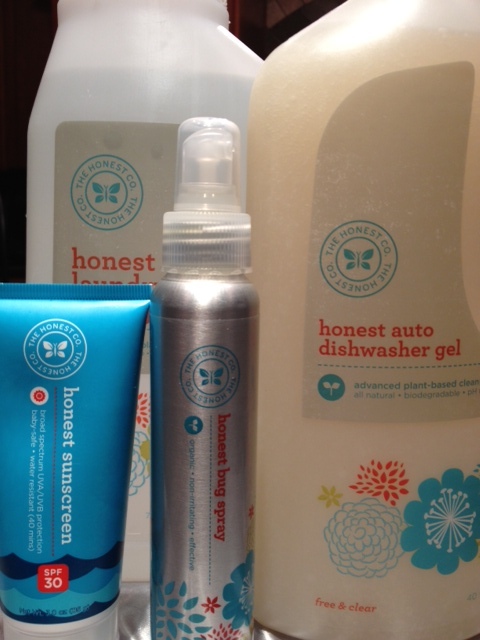 Yesterday I received my full blown Family Essentials Bundle from The Honest Company. If you read my previous post, you know that I started with the sample pack, liked it and ordered company’s non-toxic household cleaners and body products. It was a sad day as I realized how excited I was over dishwasher rinse aid. Nonetheless, I broke into the cutest box I have ever seen to find my shampoo, conditioner, hand soap, sun block, bug spray, dishwasher detergent, rinse aid and laundry detergent. I have tested all of the products except the conditioner. I LOVE everything. I even tested out the old bug spray as I took my dog on a walk at dusk… in Texas, where the mosquitoes are as hungry as Willie Nelson after he steps off his tour bus. I did not get one mosquito bite. Yesterday, I stupidly went on a four mile walk at 1:00 PM. It was a lovely 105 degrees. I used the sun block (and a hat) and did not get a sun burn. I did almost get a heat stroke which would have interfered with my late afternoon wine tasting party, but I rallied. I don’t think it had anything to do with the good sun block though. There’s really not too much I need to say about the cleaning products except that they work. They are non-toxic. It makes me happy. I like the name of the company because it’s actually true. I just wonder if the products will last a full month. I’ll let you know.